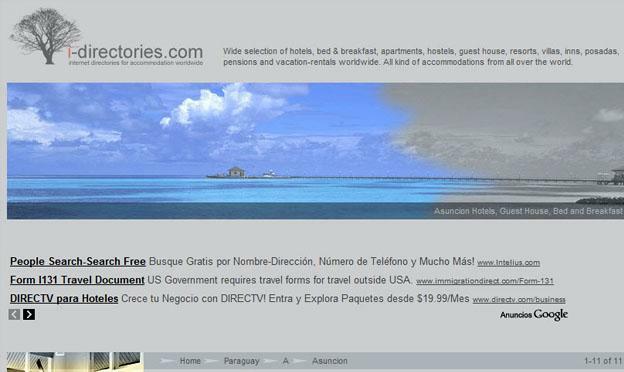 Online hotel directories each have their own method of organizing the hotels they list. We go over five ways of doing this and the pros and cons of each. 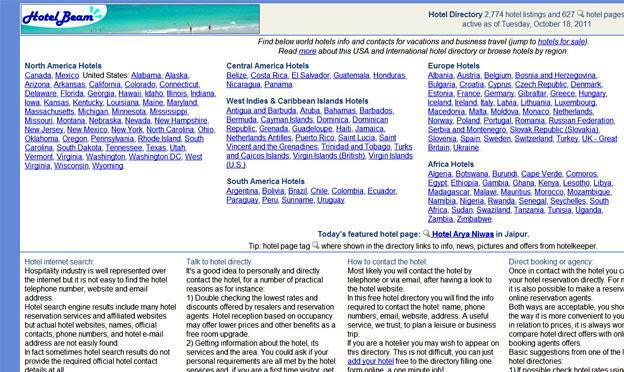 There are dozens of online hotel directories out there—some local, some global. Each has its own unique way of displaying the hotels they list, but are all methods equal? Google has developed secret algorithms to determine what websites are more relevant, and SEO experts everywhere have been trying for years to crack the Google code so they can rank better. 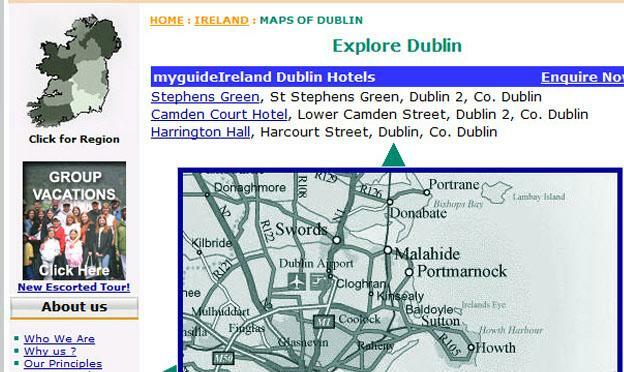 Let’s take a look at how online hotel directories list their results. Wandari is a new online hotel directory that takes a unique view of hotel directories. They display a Google-powered map that shows green “orbs” all over the globe. Each orb contains a number of hotels within it. As you scroll in, the orbs divide like cells, giving you more detailed information. Click on an orb and then a directory appears to the right in a nice, smooth interface, listing the hotels within. But what I’ve noticed is that, instead of listing the hotels alphabetically or by rating, it lists them by completion. For example, click on a random orb. The hotels at the top often have beautiful pictures, contact information, rich descriptions and room listings. As you scroll down, the resulting hotels have less and less information listed, until you find ones that have no pictures whatsoever. This means that the hotels at the top, the “cream of the crop” give browsers the best experience by having the most complete information. This is an interesting and thoughtful way of providing pertinent hotel information to guests. Hotel Beam employs the classic “link stuffing” approach. And it works. When I was doing my research, Hotel Beam was the first result for “hotel directory”. They succeed by stuffing their homepage with a cloud of links—there is very little white space or text that is NOT a link. While apparently successful in terms of SEO, what is the user experience like? How to they rank internal content to offer the best results to browsers? Navigating through the directories gives the browser locally pertinent information about the hotels in specific areas, but it doesn’t tell us anything about the quality of those hotels. While such a link-stuffing strategy may be successful for the SEO prominence of a directory, it provides an abysmal user experience. My Guide Ireland is an example of a great concept marred by lack-luster execution. Like Wandari, they employ a map-based navigation of their hotel directory—however, instead of having a dynamic, instant experience, the map navigates like a two-dimensional point-and-click RPG video game from the early 90s. As you look at the artistic (not photorealistic) map of Ireland, you can click on the counties for detailed local information. As you delve deeper into the map, a list of hotels in the area you see is displayed below, which includes a photo, rates and an inquiry link. You can then shift the map north, south, east or west, and the list of hotels updates to show you what is included in the area you are looking at. This directory actually gives great, valuable information that can help guests as they are planning their stay. Their user experience needs a serious update, however. i-directories is one example of hundreds of identical websites out there that are pure databases. Anyone can create a database. Open up Excel and start inputting information—bam, a database. When users browse a website they want more than a database. They want an interesting user experience that makes their job of finding a good hotel easier. Directory after directory of pages and subpages is not that. i-directories works as your link browser. It starts with nations, then goes to cities, then to smaller districts and, finally, a list of hotels with links to the hotel website. It differs from more robust directories by being completely devoid of any good information besides a link. No photos, no contact information, no rich descriptions; just a link and, if you’re lucky, a star rating. This is 90’s web design which is quickly being phased out by more modern approaches. Street Directory is a Singapore directory for many businesses including hotels, but works as a great example of talent being defeated by poor UX design. On one hand, I want to like Street Directory. They created their own map with vibrant colors that is fun to look at. Where it fails is in its delivery of information and cluttered interface. 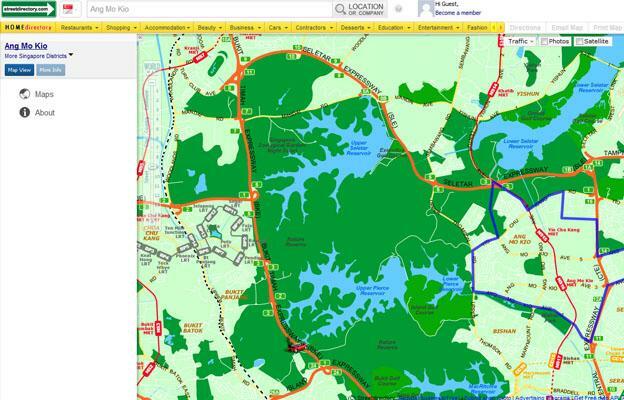 Instead of seeing interesting things appear visually on the map as you browse, which is expected, you are presented with a navigation bar at the top where you can select the kind of business you are looking for. Small triangles which are poorly contrasted against the vibrant colors of the map appear—and if they don’t, you need to zoom out until they do appear. While a bit awkward, it is capable and only takes a little bit of time to get used to. The greatest hindrance, however, are the ads. Now ads, I like. I understand that many businesses succeed or fail on ads alone—I have nothing against them. However, in this case, they are implemented so poorly that it dramatically detracts from the user experience. When you select a business listing, a landing page appears that has an ad that takes up the full width, a tag cloud that offers no help and a snapshot of the map you just viewed. They have a link to the website, but if you click on it, it just takes you to another page on Street Directory with more ads and a phone number. While artistically interesting, it is far too cluttered, which is sadly the fate of many hotel directories that use ads to generate revenue. In closing, what have we learned? That good hotel directories have the following characteristics. Hotel directories that embrace these characteristics will do well on the constantly evolving web. Brandon Dennis is the marketing manager at buuteeq, inc., the digital marketing system for hotels. Subscribe to the company blog for web design and directory news.